The price includes fuel and electricity; bed linen (except cot linen), towels and tea towels are provided, and necessary household items such as dishwasher tablets. 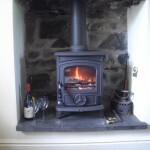 The cottage is warm and cosy, with thick stone walls and double glazed sash windows. It is heated by Rointe heaters , and an Aga multifuel stove in the living room; smokeless fuel, kindling and firelighters are provided. There are wall mounted panel heaters in each of the bedrooms, and heated towel rails in the bathroom and the downstairs shower room. The large living room, decorated with Farrow and Ball colours, has many original and interesting features; the floor is slate flagged; there are exposed oak beams as well as ceiling hooks from which utensils used to be hung, and the original wooden shutters and doors. It is furnished with a Laura Ashley sofa and armchairs, Ashley Wilde curtains, cushions and rugs, and an LCD Smart TV with DVD/CD player. It is a comfortable room in which to relax with a glass of wine or beer after a hard day of walking. The study next to the living room is well stocked with things to do, including maps and guidebooks for planning walks and days out, novels, DVDs, CDs, and games for rainy days! There is also a phone with an “honesty box”, and free wifi/broadband. The kitchen adjoins the living room; it is decorated in Farrow and Ball colours, and has limed oak units, an electric cooker with ceramic hob, fridge freezer, microwave and a dishwasher. There is a washer dryer concealed in a small utility area next to the downstairs shower room. The dining room, which was designed and built in 2001, is decorated in Farrow and Ball colours and is furnished with a large Laura Ashley oak table with chairs for five. 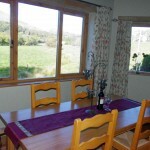 The windows give superb uninterrupted views of the Old Man of Coniston and the surrounding peaks. Outside there is a picnic table on the terrace for outdoor meals. There is also a seating area to the front of the cottage next to a raised lawn and to the side, a cottage garden planted with roses, shrubs, bulbs and perennials. Upstairs there are three bedrooms and a spacious tiled bathroom with a power shower over the bath. It is possible to see the Old Man and the fells whilst taking a bath! The double bedroom is comfortably furnished with duvet, patchwork quilt and plenty of drawer space. The twin bedroom also has duvets, quilts, chest of drawers, wardrobe, two wall cupboards and the original cast iron fireplace. Each bedroom has white iron bedsteads with luxury pocket sprung mattresses, window seats, sash windows and fully fitted carpet. The single bedroom is furnished with a pine bed, duvet, patchwork quilt, wardrobe and linen chest. There are more internal photos of the cottage on the gallery page. 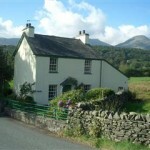 Fantastic views, great location.- You are to be commended for your cottage- it felt like a home from the minute you walk in. Lovely touches that make all the difference. Well done we had a fantastic time!